Last April, the University of North Dakota hockey team’s season ended abruptly in the semifinals of the Frozen Four. UND played their game plan to perfection, but still came up short. The loss didn’t sit well with the UND hockey team. UND head coach Dave Hakstol explained. Fast forward to this season: there’s a lot to get excited about, UND returns a majority of their players from last season’s squad that went (25-14-3, .630). Also, UND brings in one of the better recruiting classes in the country. The UND hockey team is primed for a big season. The 2014-15 UND is a talented hockey team, however, this isn’t a team loaded with a lot of explosive fire power through the forward lines. If this team is going to be successful, it’s going to be as a result of everyone buying into their roles. Don’t be surprised if the d-core leads the nation in points per game again this season. Last season, the NCHC was a very tough league. I don’t see any reason why this season will be any different. Every game is a war, and there are no off nights. Take a couple of nights off and your team drops from first to fourth. 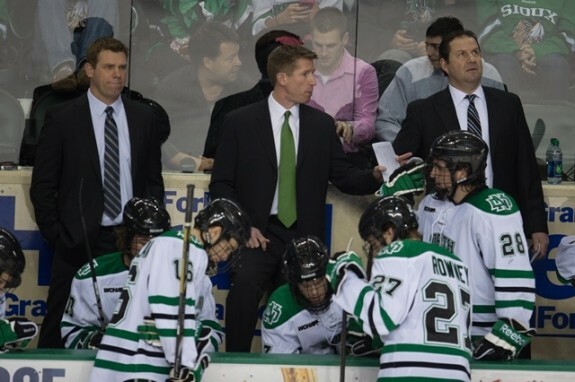 Last season’s NCHC schedule appeared to prepare UND for the 2014 NCAA playoffs. In the past, Coach Hakstol has been frank about the NCHC’s competitiveness. Moreover, the UND coach seems to relish the fact that the NCHC is such a tough league. In conclusion, if last season taught us anything, you can expect the unexpected this season. With that being said, there’s a lot of enthusiasm surrounding the UND hockey program this season. This team could go a long ways if everyone buys into their role.